It quite sound like fun coming on national television but for me I had surrendered to live with my camera-fear and declined numerous requests to participate in panel discussions before. This time, however, I had to keep aside my fear for many reasons; there were a few important people counting on me, I also had to do justice to the dedicated reporter who was working very hard for this program and most of all for Rigsum Sherig Collection itself, the cause I truly believed in. Agreeing to come on the show was the first thing, next step was trying hundred ways to escape it. When I found no excuse in this world I began wishing for something to happen at BBS studio that could force them to stop the show. Well that’s it, there was no way out. I couldn't sallow a piece of best fried chicken at the dinner I was supposed to enjoy with my friends. It broke my heart to leave the special dinner and whiskey untouched. 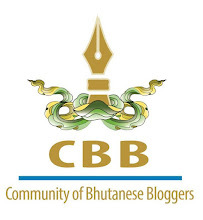 On my way to BBS studio, I tried answering to some imaginary questions in pure Dzongkha. I sounded so fake that I stopped the car immediately. I didn't want to chicken out of it but I also didn't want to clown on national television. Suddenly the teacher in me came out and told me to relax and do it the way I do every day with my students. Why didn't I remember that? At the studio Sherab Zangmo, the producer of the show was waiting. She was so much at ease when I was almost shitting in my pants. She sent me with another lady to the makeup room- yes makeup, after all you are going before camera. I was given a light ‘touch up’, many things were happening for the first time in my life that night. 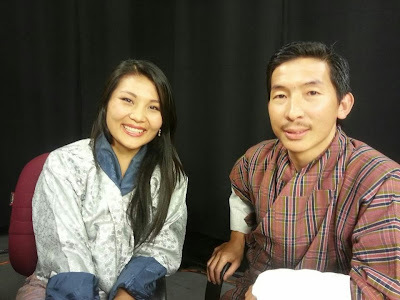 I was finally on the BBS set with Karma Dorji, the man I always saw on TV and once I was there I felt very relaxed; after all there were only two cameramen watching was literally. I explored the set, the place from where the news was telecast everyday. I looked at everything, the paper in front of the new reader is just a copy of what is appearing on the screen and we could see ourselves on another screen. I was like a little boy in a toy shop. All thanks to Boaz, who gave me the inspiration and courage to fight my fear. Thanks Rigsum for giving us Sherig Collection, and Thanks Sherab Zangmo for the show and momo, which I could eat though. Good to know that. I watched you on Dzongkha but missed the English section - didn't know you were on both! But I liked the way you delivered - you spoke the casual Dzongkha - using both the pure Dzongkha and a few terms in English. I like that. It is when people try to speak everything in supposedly "pure" Dzongkha, it loses the meaning. Yours was something we all could understand and relate to. Keep appearing on and on. And the fear of coming out (just like an HIV patient) is still deep in us. Of course being a teacher you overcame it swiftly. Keep it up! I watched both the Dzo and Eng segment and Passu Sir, you were good at it. There was no hint of nervousness and if I remember you used 'actually' quite generously which is understandable :). Well it's nice to hear you speak (more so as a blogger than anything else). Even though we haven't met I can articulate how you speak now. What I liked the most was that you weren't fake at all...and it's so difficult to listen to someone who's fake...the fakeness is actually so obvious, people don't realize it themselves. You gave wonderful interviews. And you really shed light on some of the important points regarding the IT and education, the wonderful initiative of Rigsum. Keep coming out on TV, and talk about how we can really incorporate the utility of IT in our school curriculum to make the classroom teaching more enriching and exciting. We really need someone like you in the education ministry to bring change in the system, for the betterment. Actually, it was ok la. Actually, you will do better with more practice. Actually, it was the beautiful TV presenter that made you nervous la. Actually, you did fine and we will assign you more TV interviews to do. I am sure all the nervousness and the worrisome was worth it. Looking forward to see you on BBS again. I think with all the motivational comments from you guys I will have to come on BBS quite often. I am eventually liking that fact that i have dared to go there.